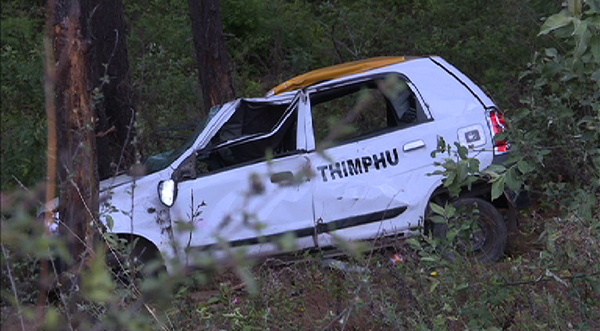 A 47-year-old taxi driver died after his car went off the road in the capital, yesterday. The taxi fell more than 68 feet below the road at Taba. Of the two passengers in the car, a 43-year-old woman has been admitted to the National Referral Hospital. She is said to be in a stable condition. The other passenger escaped without any injury. Police said speeding caused the accident. Similarly in Gelegphu, a 30-year-old man died in an accident at Dawla Khola along the Gelegphu,-Zhemgang highway on May 26. The incident took at around 11 PM. The car went off the road and hit a tree. There were two people during the time of the accident. The driver suffered minor head injuries. The cause of the accident is under investigation. Dzongkhag Kidu Offices of Thimphu and Gelegphu have handed over His Majesty’s semso to the family members of the deceased.